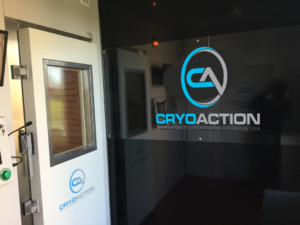 CryoAction, the leading supplier of cryotherapy chambers to elite sports has launched a rental fleet of its transportable cryotherapy chambers. The chambers will be delivered to a client’s site and are configured to deliver whole body cryotherapy to up to 4 persons in any single treatment. The 6 metre whole body cryotherapy unit offers an attractive changing area, a state of the art, fully computerised 2-stage cryotherapy chamber and all the equipment necessary to deliver treatments such as specialist footwear, clothing, gloves & hats. A large liquid nitrogen vessel is also included to fuel the unit in collaboration with our partners, BOC. Comprehensive training on the operation of the unit is offered to our client’s medical staff with CryoAction unique online support assistance available throughout the rental period. The CryoAction rental cryotherapy chambers are subject to a minimum rental period of two weeks and customers going forward to purchase their own unit, receive 50% of their rental fees refunded against the purchase price.